Decorative Life: Many months to years depending on environment. Common “geraniums” are mostly in the genus Pelargonium whereas there is a genus called Geranium that contains many wild species. Some favorite cultivars and their respective flower colors include ‘Imperial’ (burgundy), ‘Excalibur’ (pink/red), ‘Pinto’ (red, white, rose, salmon, violet), ‘Ringo 2000’ (same as ‘Pinto’ but more compact), ‘Americana Dark Red’ and ‘Americana Light Pink Splash’, along with the Elegance and Royality series, each with many colors. From the Greek “pelargos” (stork) named for the beak of the fruit looking like that of a stork. The American Academy of Allergy, Asthma and Immunology list this species as an allergy-safe pollen producing plant. 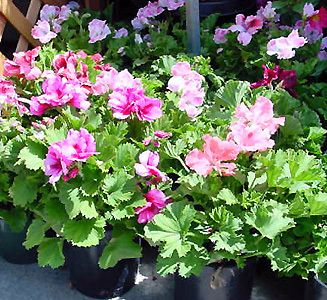 There is a very large group of geraniums that are grouped together and called Pelargonium cultivars. They are mostly smaller flowered, have scented leaves and are of a wide range of habit and foliage. Some of the “scented” geraniums fit this cultivar group while others are specific species.